NASA’s Juno mission to Jupiter arrives in just about a day, after a 5 year journey that began in August of 2011 aboard an Atlas V rocket. 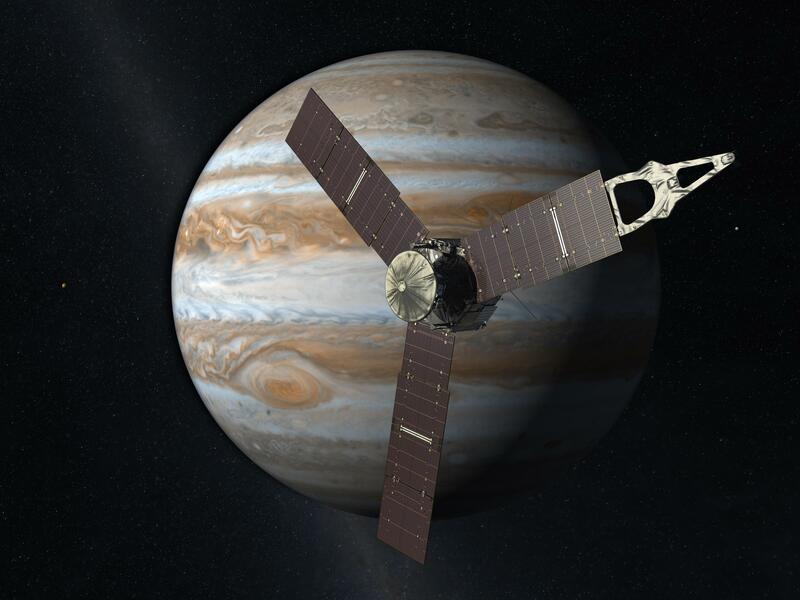 The Juno mission is primarily concerned with studying the magnetic fields, particles, and structure of Jupiter. Finding out how Jupiter works, and what its core is made of are some of Juno’s goals. 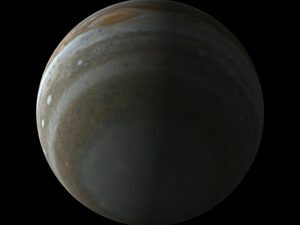 None of the experiments need a camera, but NASA decided, in the interest of public outreach and education, that if you are going to spend $1 billion to send a probe to Jupiter, it probably should have a camera. Energetic particle detectors, Magnetometers, and Auroral Mappers are great for science, but what the public is inspired by is pretty pictures of wild and distant worlds. Juno is powered by a now familiar computer, the BAE RAD750 PowerPC radiation hardened computer. It operates at up to 200MHz (about the processing power of a mid 1990’s Apple Computer) and includes 256MB of Flash memory and 128MB of DRAM. It (and the other electronics) are encased in a 1cm thick titanium radiation vault. Flying in a polar orbit around Jupiter, Juno will experience intense radiation and magnetic fields. The probe is expected to encounter radiation levels in the order of 10Mrads+. The vault limits this to 25krads, within what the electronics can handle. It should be noted that a dose of 10krads is fatal in most cases. This intense of radiation will degrade the prober, even with shielding, resulting in a mission life of only 37 orbits (a little over a year) before the probe will be gracefully crashed into Jupiter. As is usual for spacecraft, the CDH (Control and Data Handling computer) is not the only processor on the probe. Many of the instruments have their own processing capabilities. The JEDI (Jovian Energetic Particle Detector Instrument) has 3 16-bit 10MIPS processors implemented on RTAX2000 FPGAs (likely RTX2000 type processors). JADE (Jovian Auroral Distribution Experiment) is powered by a 48MHz 32-bit SPARC processor. Each of the radio systems also have their own computers to keep them in shape. This allows for easier power budgeting and fault tolerance. Speaking of power budgets, Juno is also the furthest a spacecraft has been from earth that is completely solar powered. The entire probe runs on 3 very large solar panels, generating around 490 Watts of power. 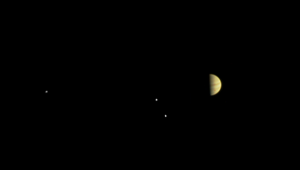 Juno will be in a polar orbit (up over the ‘top’ vs around the ‘middle’ ) which will result in some very unique views. This is a simulated view of what we can expect. Curiously, the camera, JunoCam, does not have its own processing. It runs on an Actel FPGA and the main computer handles image processing. There are 2 main reasons for this. First, the camera is not a primary instrument, and thus was fairly low budget. It’s design is borrowed from the camera on the Mars Curiosity rover, and much of its software is borrowed from the Mars Reconnaissance Orbiter. Total cost of the camera is around $3 million, chump change as some would say for a nearly $1 billion mission. Second, radiation is really hard on camera electronics, the camera is designed to take a picture, and get the raw data to the main (better shielded) computer as fast as possible. It should however still be able to provide some very nice pictures of Jupiter, and providing tomorrow’s 35 minute orbit insertion goes well, some great science from the biggest planet in our solar system.